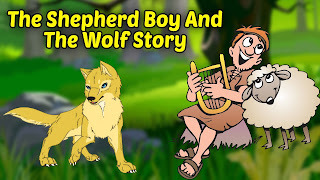 Let us enjoy reading this story of The Shepherd Boy and The Wolf. T here was a village on the outskirts of a forest. A shepherd boy used to take his herd of sheep across the fields to the lawns near the forest. One day he felt very boring. He wanted to have fun. So he cried aloud "Wolf, Wolf. The wolf is carrying away a lamb". Farmers working in the fields came running and asked, "Where is the wolf?". The boy laughed and replied "It was just a fun. Now get going all of you". The boy played the trick for quite a number of times in the next few days. After some days as the boy, perched up on a tree, as singing a song, there came an wolf. The boy cried loudly "Wolf, Wolf, The wolf is carrying a lamb away." There was no one to come. The boy shouted "Help! Wolf! Help!" Still no one came to his help. The villagers thought that the boy was playing mischief again. The wolf carried a lamb away. MORAL : A liar's truth is seldom believed.